Investors and Private Owners, this bright cabin is located in one of the ONLY areas in SPEARFISH CANYON with NO COVENANTS, where FREQUENT RENTALS are ALLOWED! 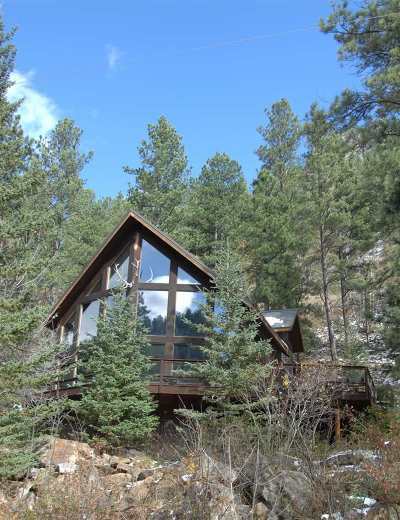 This furnished cabin sleeps 7+, offers privacy, views, plenty of natural light, a HEATED GARAGE, outdoor activities and more! Set back from the highway, across the Creek and backed by Forest Service land, just spend one night bbqing on the deck, or sitting around the firepit and you just may be hooked! Coffee on the private deck off the master bedroom or cocktail contemplation at the bench below "THE ROCK" -which suites you? Trails within miles, Spearfish Creek only a walk away, a brand new bridge across the Creek, the Latchstring for breakfast, and whispering winds offer enjoyment at this home away from home! Rental income worth consideration!